driveway installation advice : Colinton Gardening Services - garden landscaping for Edinburgh your local landscapers, designers & consultants. Please remember, we are a phone call aways from friendly advice. What is a reasonable budget for your driveway project? Property experts suggest setting aside between 4-6% of your house value to renovate your driveway. The amount is based on how much value you will actually add by taking on this driveway project. Potential property buyers will always look for well designed and constructed outdoor space, and they prioritise it highly. Indeed, a well designed driveway sets a great first impressions for your visitors. If you are struggling to set a budget for your driveways project then give us a call for a free, no obligation consultation to discuss your options. Advice for choosing materials for your driveway (monoblock & block paving) project. There is a vast range of paving slabs, monoblocks and block paving driveway materials available, in all budgets and all tastes. There are different colours, textures, shapes and sizes for your garden patio or driveway project. . Please remember that your choice of paving slabs, monoblocks, block paving driveway materials is something you should consider carefully – you will be looking at your completed driveway project for years to come. We can bring trade magazines and samples of driveway materials so you can see the range available. Some of our building merchants have an out door display area where you can see samples of monoblock driveway & block paving materials in a display area. It is a false economy to source cheap garden patio slabs, monoblocks and block paving materials. For sure, it is possible to save money on unbranded materials. It is possible that cheap driveway materials may not be frost proof and over time they will delaminate. Are these materials ethically sourced? Some driveway materials (monoblock driveways and block paving) come from India. We only use materials that our suppliers have policies in place to ensure fare treatment of local staff. Want localy sourced Scottish landscaping materials? We have relationships with quarries based here in Scotland. Monoblock driveways and block paving have both become very popular in recent years. But, what are they? Today, we’re doing to introduce you to both of these things and talk about them in more detail. We’ll explain what they are, and why they might be a great choice for the exterior design of your home. Block paving is most often used to decorate areas outside of your home. It’s sometimes known as brick paving, but they’re both the same thing. This method of paving is very popular for so many different reasons. From a practical point of view, block paving means laying down bricks which create a very stable and solid surface meaning your paving can take heavy loads with ease. But, the true practical benefit is that bricks can easily be removed and replaced if they ever do become damaged. So, let’s say your block paving suffers a bit of damage and one of two bricks become chipped or broken. Don’t worry, you won’t need to pay for a full paving makeover, you just have to get the broken bricks replaced. From a design point of view, block paving is truly the way forward. Due to the way the bricks are laid, you can create various patterns. You can lay the bricks down at different angles to give off different effects that will truly amaze your guests and leave them in awe. Block paving is most commonly used in the garden - front or back. It’s a fantastic alternative to patio or decking and will last longer while looking beautiful too. Now, monoblock driveways are simply a type of block paving. The main difference is, this paving is designed as a driveway rather than being present in your garden. Why would people enjoy monoblock driveways? It’s simple, their structure means the driveway is very compact and stable, so the blocks won’t get damaged under the weight of multiple heavy vehicles. Similarly, it’s a smooth surface for a car to drive on, which is far more preferable than having a gravel driveway or one with pebbles. There's far less chance of your car being damaged if it's got a nice smooth driveway to rest on. Of course, the main reason people like monoblock driveways is due to how they look. They’re truly stunning, and you can really play around with the different block paving patterns here. You’ll find that a driveway gives you more room to experiment with different angles and create a pattern that amazes guests the moment they arrive at your house. Monoblock driveways and block paving give your property a serious style boost. The great thing is, you can find so many different varieties of decorative paving blocks to lay down. Of course, it always pays to get your paving work done by professionals with years of experience in the trade. Here at Colinton Gardening Services, we’re more than happy to supply you with paving that makes your home shine. Then, you’ll be the envy of all your neighbours as you show off the incredible monoblock driveway and fancy block paving in your garden. At Colinton Garden Services, we love building various driveways for our customers. We’ve got a plethora of types and designs to choose from that will upgrade the exterior design of any property. Monoblock driveways & monoblock paving are so popular and look gorgeous. They can take a long time to install, but our team of experts has enough experience to get the job done quickly without compromising quality. What’s great about monoblocks is that they’re incredibly durable and will last for ages. However, at the same time, they’re very versatile and suitable for many different driveways. You have a whole range of styles and colours to choose from, and our driveways are designed to your needs. Tell us what you want your monoblock driveway to look like, and we’ll gladly do it. Block paving is a popular alternative to monoblock driveways if you want something cheaper and less time-consuming to install. Of course, the only drawback is that you lose some of the expert durability that you gain with monoblock driveways. But, block paving still has many practical and visual benefits. Visually speaking, this paving looks great, and you can choose how you want the bricks to be angled when they’re laid down. As a result, you can create some beautiful patterns that will turn heads. We’re always there to give our expert design advice, but the final decision is entirely up to you! Our resin bonded driveways can transform your driveway and give it a gorgeous look. As well as looking stunning, they’re also extremely permeable meaning you never have to worry about hazardous and ugly puddles. These driveways are so popular amongst people that want something simple yet elegant. We guarantee you’ll see no stones out of place, and we also supply so many different texture and colour options too. As always, we leave the decisions up to you. We realise it’s your property and will cater to your designs. We also provide a range of sublime tarmac driveways that can provide your property with something extra. Tarmac driveways are very simple to install, but that doesn’t mean they’re not amazing. They give your house a real high-class feel as your driveway is now covered in smooth tarmac. It feels great under your car and will definitely stand the test of time too. Many of our clients enjoy combining tarmac driveways with some of the other options on this list, particularly block paving. By mixing two different styles, you get the structural benefits of tarmac and the visual appeal of something like block paving. Let us know what you want, and we’ll provide it for you. We’re an award winning company, and we love what we do. 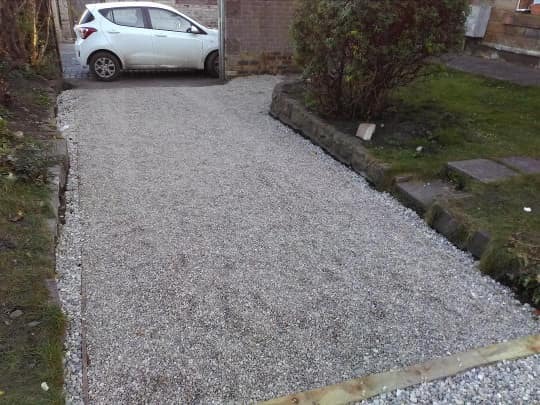 We’ve been upgrading people’s properties by providing delightful driveways in Edinburgh for them to enjoy. We love seeing the finished article and witnessing the joyous expressions on our customer's faces. It motivates us to keep providing the best service around, and we love building driveways to make you happy. So why not contact us on 07717 461 184 about your "driveways Edinburgh" project and get a free, no obligation estimate.